Visitors to India often comment on the serendipitous surprises they encounter: an elephant in traffic, a roadside celebration with dancing and music, a clever gymnastics performance during a traffic jam. Well, recently San Francisco held its own. 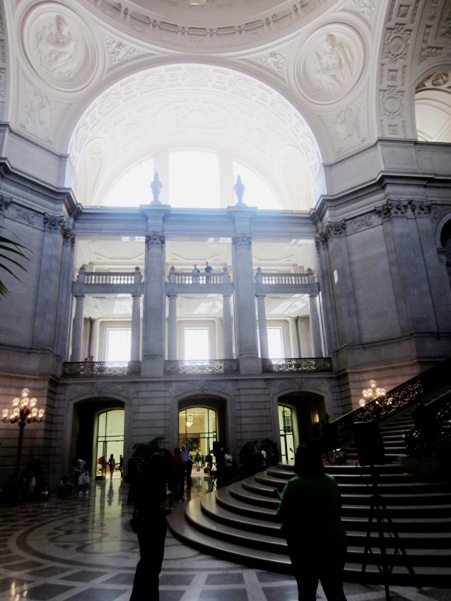 I’d gone to City Hall for a meeting. 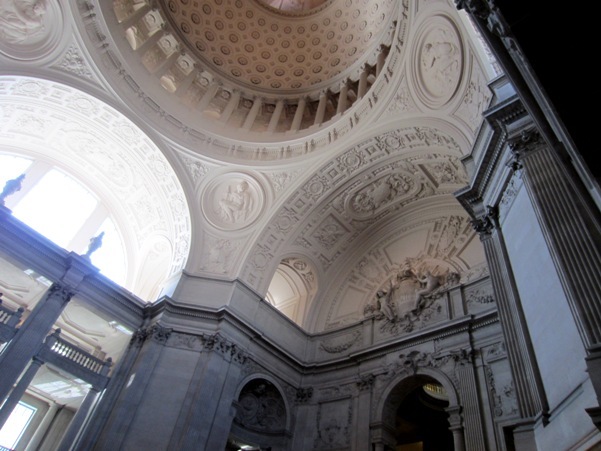 For those unfamiliar with it, San Francisco’s City Hall is a beautiful beaux art domed building; inside, there’s a dramatic marble staircase beneath a three-story rotunda. It’s where marriages are registered, and legal weddings performed. Often the young couple honor the occasion by dressing up themselves, so there’s a certain festive atmosphere to what is essentially a bureaucratic office building. There’ll almost always be a bride or two floating around in fairy-tale white gowns, often accompanied by cute kids all dressed up too. But Friday last, it was more than happy brides. I entered the building to the sound of a tabla, looked around, and on the steps at the first landing saw a musician sitting at his instrument, drumming away. I stood around, intrigued. The tabla stopped, and gave way to the energetic beat of a dholak. And half a dozen young women in pink and green salwar-kameez inspired costumes came bounding out to perform a bhangra. All the bhangras I’ve seen before this were performed by men. It’s an exuberant and energetic dance, originating in the Punjab. These women definitely captured the spirit of the thing, even if they didn’t make some of the acrobatic moves I’ve seen from bhangra performers in India. The pace and energy was awesome. It’s one of the Rotunda Dance Series. So maybe there are other surprises in store for people who think they’re going to a government meeting. 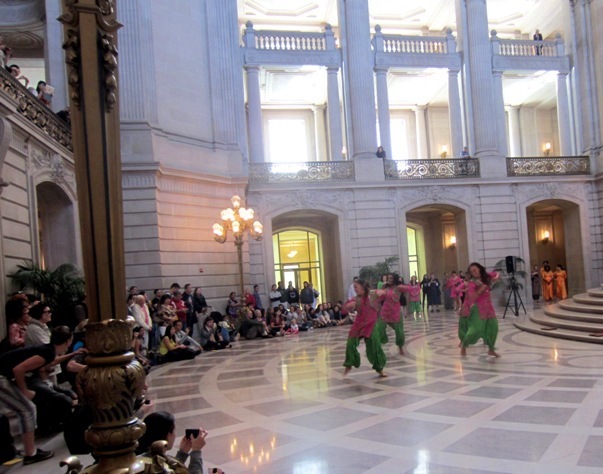 This entry was posted in General and tagged bhangra, city hall, dance, san francisco. Bookmark the permalink.